Steam power captivated the popular imagination in the 19th century. Regular steam navigation on the Connecticut River dates back to the early 1820s. 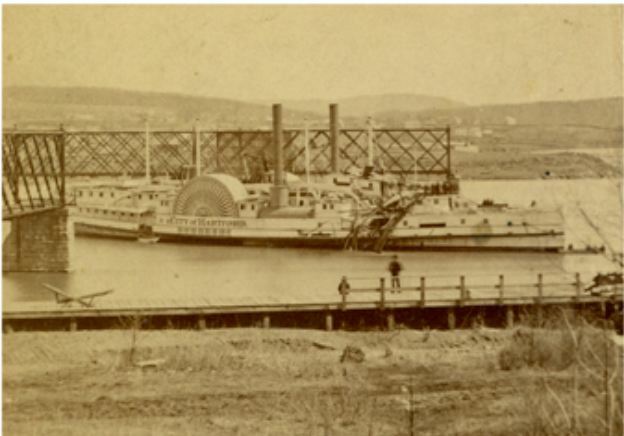 Hartford and New York were linked by steamers whenever the river was ice free, typically from March through November of each year. Advances in both construction and propulsion enabled the building of ever larger, more powerful and luxurious coastal and passenger steamers. 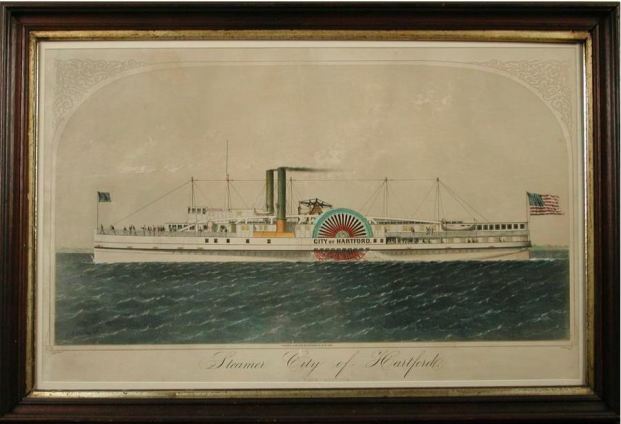 In 1852 the splendid new City of Hartford entered service and for three decades reigned as one of the undisputed queens of the river. At 273 feet in length, the vessel was celebrated both for her external appearance and internal passenger accommodations. The other mode of steam transportation was the railroad, and as east-west rail lines were built across the state, bridges were built across major rivers like the Thames and the Connecticut. 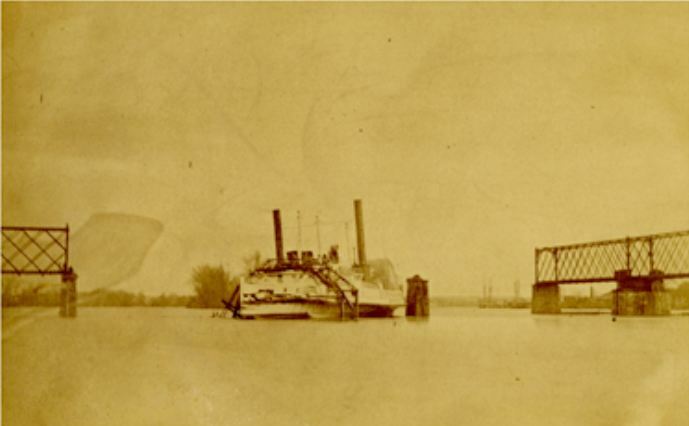 In the early 1870s a swing drawbridge was built connecting Middletown and Portland on the Boston & New York Air Line Railroad, which ran between New Haven and Boston. 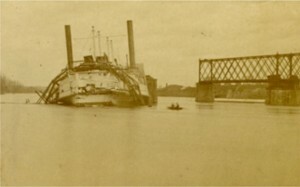 Maritime interests had long opposed bridging the river, citing the potential dangers to navigation, but had lost the legal fight. Their fears were realized in spectacular fashion on the night of March 29, 1876. The spring freshet was in full force when the City of Hartford approached Middletown en route to New York. As the fast current drove the vessel rapidly toward the drawbridge the river pilot, who navigated the vessel from Hartford to Saybrook, mistook lights on the Middletown shore for those marking the open passage through the bridge. Too late, he realized his error, and as the vessel plowed out of the channel toward one of the fixed bridge spans the captain, pilot, and helmsman fled the pilothouse. Almost immediately a tremendous crash was heard in Middletown and Portland. Morning brought an amazing sight as the badly damaged City of Hartford sat motionless in shallow water pinned down by the weight of the crumpled railroad bridge span draped over its superstructure. After four days of work, the vessel was extricated from the tangle of iron and wood and towed away for repairs. The Air Line Railroad was understandably furious at having its route severed and rushed repairs to the bridge. Before long both steamer and bridge were back in service, and a rule was instituted requiring drawbridges to mark their open passage with distinctive red, not white, lights. In 1883 the City of Hartford was rebuilt and renamed Capitol City. 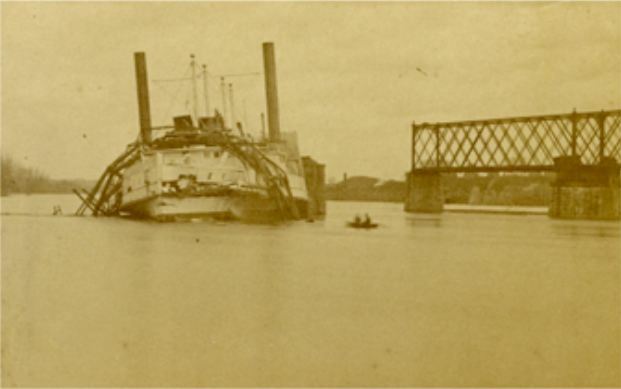 She continued linking Hartford and New York until late March 1886, almost 10 years to the day of the bridge collision, when she was wrecked in bad weather off Rye, New York. The repaired railroad bridge served for years until replaced by the steel structure now used by the Providence & Worcester Railroad.